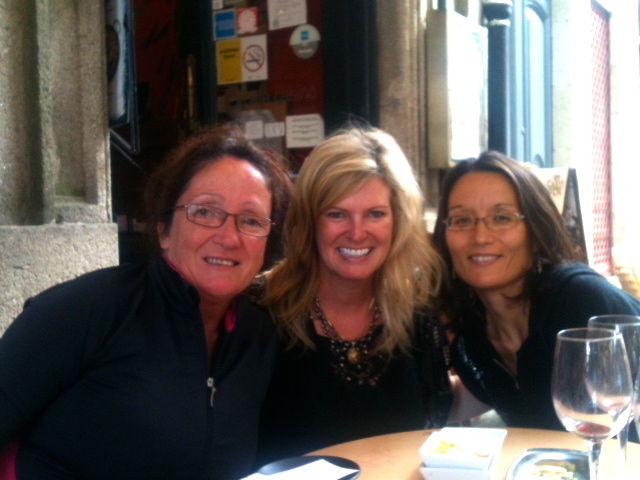 Again Synchronicity provided me in meeting and creating two very special Camino friendships. Lisa Moore (right side of photo) who in Fall of 2011 walked through Vilei and agreed to participate in German Limeres’s Rexistro 108 Vile Pilgrim Photography Project and to share with me on video her thoughts of the Camino. Lisa was so kind to come to visit last week during the St. James Celebrations and to reconnect in Santiago and the Camino that brought us together. Sylvie Sims, seated on my left, and I connected while we were finishing our camino journey just before arriving into Santiago July 2012 for the St. James Festivities. Just two days away from Santiago I had stayed in a casa rural all alone with no one else in the house. I was trying to stay at another casa rural but they were completely full so we tried another one on the list and not only were they free again no one else was there I knew this would be a perfect place to rest, relax and reflect on my camino before arriving in Santiago. The owner offered me the opportunity to enjoy a book from their wonderful library collection in the room of the historic old cooking fireplace where you know many fantastic stories were told and took place. It was the only book they had in english. The smell of the wood and many burnt embers wrapped me in a warm blanket of special memories as I began to read. I was enjoying the book so much I asked if I could borrow it and would mail it back when I had finished. He happily agreed and so I set off on my journey and had no idea what it would lead to. Funny that the book was about an Irish adventure and I would on the next day be walking out of Arzua on my way to Pedrouzo and would make a stop at a little local bar that had a lovely park setting outside. This place was very special for me as it was the first place outside of Santiago that I went to film pilgrims’ and hear some of their stories. I heard Sylvie on the phone and her lovely voice with her beautiful “irish accent” that caught my attention. It is a funny way that the signs show up all in different ways and at different times. But with this I noticed right away that I had just been reading the book that morning over coffee and there sat Sylvie just next to me at the other stone picnic table. I got up and spoke to her as soon as she finished her call and introduced myself. It was an immediate wonderful connection that we then shared some time walking on the Camino and a refreshment at the next town before Sylvie decided to continue on her Camino and get a little closer to Santiago – in all Sylvie would walk 54 KM that day – impressive and inspiring as she wanted to savor the feeling of her camino journey with more solitude as she arrived into Santiago and wanted to get a bit farther to enter the city the next morning alone before more of the pilgrim crowds arrived. I feel very lucky that we stopped at just the same place which provided a new beginning of a friendship. We would then run into each other 3 more times in Santiago. Which again might seem very common in the historic district – but with St. James Festival pilgrim’s and the town with more visitors than normal Sylvie and I took note and enjoyed a few more glasses of wine and some Camino stories during that trip July 2012. A few emails would be exchanged and many thoughts that in some way for sure continued to keep our spirits connected as for it was a year later just a week ago that I would be walking through Santiago with Lisa and German having just told Lisa of how I met Sylvie – not more than 45 minutes later there sat SYLVIE and her partner Oliver – Sylvie jumped to her feet and said “I just told Oliver if Susan Mann is here I hope that I would see her standing on the stone pillar inside the Cathedral watching the Botafumeiro – and here you are not 45 minutes after me telling Oliver the story”. Sylvie and I had enjoyed a special “swing” of the Botafumeiro together in 2012. As every Botafumeiro experience is special and unique but I had shared with Sylvie that I always went early to stand on one of the stone pillars to get a great view and I would hold a spot for her it worked for her to join me. I am so very grateful for another special memory in Santiago and for our reconnection. There have been many more “Irish” signs for me and I hope to visit Sylvie, her family, and Oliver on an adventure to Ireland. I hope you enjoy Sylvie’s comments on Destiny and Life. Thank you Sylvie for your loving, kind and generous spirit it is an inspiration. I look forward to sharing more of your Camino story and Lisa’s in future posts. This entry was posted in Camino Inspirations!, Camino Stories & Syncronicities and tagged camino, Camino Gratitude, Camino Stories, celebration, festivals, Inspiration, Personal Development, Synchronicity, The Way, traditions. Bookmark the permalink.